With thebestof, a franchisee becomes part of the community and works to connect local people and the businesses and organisations that serve them. The aim is to make local life better for everyone. Our franchisees identify the best businesses in their local area and then using a suite of marketing tools unique to thebestof, work with the business owner to showcase and promote them. Founded by our CEO, serial entrepreneur Nigel Botterill, thebestof quickly became the fastest growing franchise in the UK and with a seven year track record, it is certainly one the most successful. Having recently launched in Ireland it is certain to have an impact in the Irish franchise market. 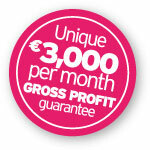 In fact, we are so confident, we are offering a €3,000 per month profit guarantee. Every new franchisee joining thebestof is guaranteed two things. The first guarantee is that they will recover every cent they invest on the franchise - in profit - within 18 months. Secondly, they'll be running a business that's generating at least €3,000 of monthly profit by the end of their first year. This cast iron guarantee just helps to underline the confidence that Nigel has in his team and thebestof business to really deliver for franchisees. Full details of the guarantee, including conditions, are available on request. "£150,000 per annum by year two is really achievable." The great thing is that with this business, what you earn is really up to you. Your earnings will depend on a number of things, like your work ethic, the time you devote to the business and how effectively you spend that time, the way in which you deploy the techniques you are taught and, of course, your existing skills, experience and contacts. Your core income will be from the monthly membership payments made to you by local businesses. Because of the multi-faceted approach of thebestof, there are also additional revenue opportunities available to franchisees. After two to three years, when you've got 200 featured businesses, your regular monthly income should be heading north of €23,000 each month. Remember: residual income is a beautiful thing. Why Is thebestof Probably The Best Franchise Opportunity In Ireland Today? "Taking on a thebestof franchise was the best business decision I've ever made. With a very low cost base, my business creates a significant profit and continues to grow." Why Does thebestof Work So Well For Businesses? "75% of my work comes from thebestof bromsgrove, I have never before been so busy." So thebestof provides business owners with exactly what they want - great value, multi-faceted local marketing that works ... and provides local people with what they want as well - the best local businesses all recommended by local people. What Does thebestof Provide For The Initial Investment And Monthly Licence Fee? "Having made the decision to purchase the Birmingham franchise, I have been overwhelmed with the high level of professional support and training that has been provided by the Head Office team. They go out of their way to support and help you grow through brand support, shared best practises and continual motivation to succeed. I am convinced by business would not have been so successful without them!" Your franchise entitles you to trade under thebestof name and to make use of the entire package and proposition to build yourself a successful business that you will manage and run. You get access to all aspects of the business, including all the marketing material, the website, newsletters, prospecting system, thebestof CRM and unlimited training and ongoing support - all included. We're very proud of the training and support that is available to our franchisees – it’s considerable, and we’re often told that it’s amongst the very best provided by any franchisor in Ireland and the UK. Who Makes A Super Successful Superstar Franchisee? "What matters most is that each franchisee is a proper people person." As Nigel offers a €3,000 per month profit guarantee, he is extremely choosy about who he accepts as a franchisee - its a people business after all. After seven strong years, thebestof team know well the characteristics required to become a successful franchisee. thebestof's application process may be rigorous, but new franchisees don't necessarily need sales experience or technical skills - What matters most that each new franchisee is a proper people person. If your bright and switched on, not intimidated by hard work to get started and you're passionate about making a positive difference to your community, then thebestof could be the perfect franchise opportunity for you. As a thebestof franchisee you'll become a 'word of mouth specialist' in your local area - a key influencer in your local business community. "I have been a franchisee for over three years and I honestly couldn't think of anything else I'd rather be doing! I love hearing and learning about other businesses and really get a 'kick' out of helping those business owners promote and market their business like no other." “For me, the single most important ingredient that I look for in any business is residual income, when customers pay you a set amount, every month. It’s the silver bullet that turns a ‘job’ into a ‘business. "The franchise is brilliant and the support is truly world class. After 3 months I already have 30 clients and a residual income of £3k a month. Many of my clients are rapidly becoming friends. I have already recommended this franchise to a friend; it’s great fun and worth every penny!" thebestof was launched in 2005 by serial entrepreneur, CEO of N5Ltd and author of the best-selling business book 'Botty's Rules', Nigel Botterill. Nigel began his entrepreneurial career as a consultant before launching My Mag a 'business in a box', inspired by his wife Sue. Within three years, they had helped set up more than 1,000 local community magazines across six countries. It was immediately apparent that while the magazines were great, the world was beginning to move online. Nigel and his team were the first to react; they began developing thebestof. The impact of thebestof was immediate and dramatic. thebestof was the first national independent web directory, competing with the likes of Yell and Thompson, and people loved the concept and simplicity of the model. An ever-evolving organisation, in the summer of 2007 the N5 team and some of the organisations top performing franchisees developed a completely new proposition for thebestof, that quite simply blew all competition 'out of the water'. thebestof franchisees are now able to offer their business members a complete marketing solution, including online, direct, outdoor media and network marketing solutions. In fact, it is this suite of marketing tools, unique to thebestof, that form the offer the franchisees take to their business members. thebestof continues to go from strength to strength with Nigel and his team amassing a cupboard full of awards along the way. To discover whether your area is still available, to get a full information pack or for an informal chat contact thebestof team. Ask us about our Discovery Days – we hold them every couple of weeks and are a great way to find out more and meet the head office team!